If you’re in the market for a giant 84-inch 4K touchscreen computer (and have about $22,000 set aside for that), today is a good day. After numerous delays, Microsoft today started shipping its Surface Hub to business customers. Surface Hub comes in both the giant 84-inch version and a smaller 55-inch HD edition for a relatively affordable $8,999. You’ll still need a stand for them, too, which will set you back another $3,699 for the rolling stand for the 84-inch model and $2,350 for the 55-inch version (or less if you just want to mount your Hub to a wall). Microsoft had originally set the prices for the Windows 10-based Surface Hubs at $19,999 and $6,999, but later increased them. 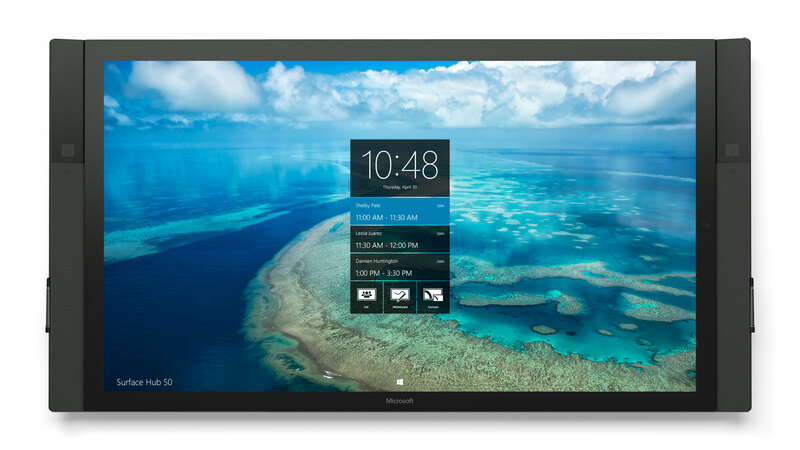 Microsoft is marketing the Surface Hub, which is based on the technology it acquired when it bought Perceptive Pixel in 2012, as a new tool for collaboration — both in person and through video conferences. Because $20,000 is obviously a big investment for any company, Microsoft worked with Forrester to commission a Total Economic Impact study. This study showed that using Surface Hub in a business environment resulted in benefits ” of more than $850,000 (3 year NPV) based on savings in device deployment and management costs, avoided printing and device purchase costs, and improved sales.” You should obviously take that with a grain of salt. Microsoft commissioned this study, after all. If you need to make an argument to management why you need to buy one of these, though, you should probably bring a copy of this study to your meeting.